Kingsoft Office is an office suite of desktop applications, which consists of a word processor - Writer , a spreadsheet program - Spreadsheets and a presentation program - Presentation. Compared with other office suites, Kingsoft Office is regarded as the best Microsoft Office alternative, which provides user-friendly interface and excellent performance. In addition to the innovative features in the last version such as multiple tabs, interface switch, powerful paragraph layout tool and Office to PDF converting, this version has added various new features allowing you to change interface color scheme, arrange windows side-by-side, add watermarks in document and convert presentations to word document. Kingsoft Writer 2012 is a product that is an alternative to Microsoft Word. It can open, edit and save the main document types: *. Doc, *. Docx (MS Office 2007) and other formats as: *. Rtf, *. Txt, just saves the file with the extension *. Html. The program has a few more features, such as flip Google Search, handler functions, support for OLE objects, PDF files. 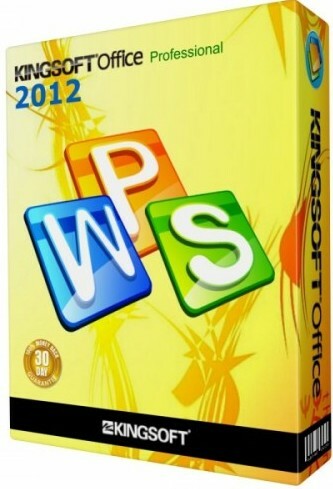 Kingsoft Presentation 2012 - replacement of Microsoft PowerPoint, it can create presentations and multimedia slide show. KS Presentation works with such files as *. Ppt, *. Pps, *. Pot. In addition, the program uses the built-in graphics, sound and Flash-objects that can be imported SWF-files. Kingsoft Presentation offers the "Dual Screen, Advanced" - you can show different patterns on different monitors. Kingsoft Spreadsheets 2012 is working with files *. Xls, *. Xlt (template), *. Dbf, *. Txt, *. Csv, and compatible with *. Xlsx file (Microsoft Office 2007). The program offers four types of encryption, including 128-bit RC4 encryption password protection for sensitive data. Program Kingsoft Office Suite Free 2012 has English interface, and is completely transparent to the user Microsoft Office. New: Support converting Kingsoft Presentation files (*.ppt) into Kingsoft Writer file formats (*.doc and *.wps).